Marshal Bowen was murdered at a Provo saloon. During the evening of October 13, the 44-year-old victim responded to a report of an intoxicated man waving a gun. 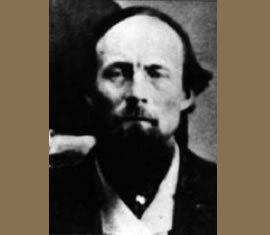 When Marshal Bowen attempted to disarm the man, he was shot in the side of the head with a .36-caliber revolver. The marshal lived for three days, dying on the thirteenth birthday of his eldest son. His killer was arrested two months later in Nevada. Convicted of second-degree murder, the man was sent to Utah Territorial Prison where he eventually became a trustee. In 1876, while attempting to prevent the escape of inmates who had previously attacked and mortally wounded Warden Mathew Burgher, he was shot and killed. Marshal Bowen was married and the father of nine children. He is buried in Provo City Cemetery. His bronze name plaque is sponsored by Provo P.D. Local #129/Police Mutual Aid Association. Our family honors this hero, the brother of my 2nd great-grandmother. May God bless him for his exemplary life and public service. He gave everything he had. I am honored to be a decedent with Albert Orlando Hastings Bowen in it. He is the Oldest brother of my 2nd great grandpa David King Bowen. He comes from good strong stock. May the hearts of the children be turned to the fathers. Albert is the brother of my 2nd great grandfather, David King Bowen. God bless him and his descendents for the service he rendered and for the life he gave in doing that service. Albert Orlando Hastings Bowen is my 2nd great grandfather. My father often told his story to me. Our family remembered him with pride. I recently took my grandchildren to the memorial so I could share his story with them. I want his story to live on. Thank you for the beautiful memorial.